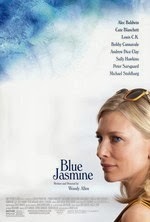 See Blue Jasmine for Cate Blanchett’s showy performance as Jeanette “Jasmine” Francis. I’m almost certain her work is just about the only reason Woody Allen’s latest has been racking up rave after rave. Bearing more than a passing resemblance to A Streetcar Named Desire, Allen’s film is a Blanchett showcase that will likely garner the actress another Academy Award nomination. Yet as terrific as she is, she’s surrounded by lazy storytelling. Told in a non-linear, flashback-driven structure, we learn that Jasmine used to live the high life with her husband, Hal (Alec Baldwin). Less a character than a catch-all symbol of corporate greed, Hal is a dirty businessman. His dealings are kept from Jasmine, who’s happy to lap up the spoils. Her sister Ginger (Sally Hawkins) visits with her husband Augie (Andrew Dice Clay). They’ve recently hit a lottery jackpot and Hal convinces them to invest their small fortune with him. Present day finds Ginger divorced and engaged to Chili (Bobby Cannavale). She and Augie lost all their money in Hal’s scheme. Jasmine is now single too, following Hal’s incarceration for fraudulent business practices. She comes to stay with Ginger, who’s quite unprepared for her sister’s increasingly fragile state of mind. Constantly popping pills and chattering to herself inanely, the flat broke Jasmine still managed to fly first class (with monogrammed designer luggage) to her sister’s San Francisco flat. Enough with the recap, there are in fact a few startling plot turns that I don’t care to reveal. Again, I must emphasize this is predominantly Blanchett’s show. Jasmine’s on-going mental breakdown is fascinating to watch. But Allen fails to develop her relationship with her sister, her estranged son (Alden Ehrenreich), or her new love interest, Dwight (Peter Sarsgaard). In fact, Dwight (a rich, up-and-coming politician) improbably believes Jasmine’s web of lies so easily, it’s difficult to care a whit when he realizes her life isn’t nearly how she described it. Ginger’s subplot involving a brief affair with some guy she meets at a party (Louis C.K., wasted in a cameo) not only renders her unsympathetic, it’s narrative deadweight. It’s as if Allen was so wrapped up with Jasmine and her post-wealth lifestyle, he forgot to craft any compelling supporting characters. Everyone else is either one-dimensional or (in the case of Cannavale as Chili) not given enough screen time to develop their hints of depth. Like 2011’s wildly successful Midnight in Paris, chalk Blue Jasmine up as another inexplicably overpraised Woody Allen movie. It’s easy to be wowed by Cate Blanchett’s tour de force, but don’t let it cloud the fact that there’s not much else going on. Incidentally, the closest Allen has come to peak form in recent years was with the generally overlooked (commercially and critically) You Will Meet a Tall Dark Stranger (2010). It’s a serio-comic gem with a better developed screenplay and a far more satisfying ensemble cast. If you haven’t already, skip Jasmine and get caught up with that one. I’m not a big Woody Allen and went to see Blue Jasmine for Cate Blanchett’s performance. Saw her in A Streetcar Named Desire and Jasmine does indeed share some of Blanche’s characteristics. Agree that Blanchett is carrying this film all the way to the bank. Thanks for the review. Thanks for the comment, islandsnoopy. Glad to hear you agree on the strength of Blanchett’s work. Without her, this would fall well below even Allen’s most mediocre films.